Regions of the world, geographically isolated from other continents for millions of years, have allowed the appearance of unique, rare and incredible animal and plant species. New Zealand is probably one of the most interesting countries. Several emblematic species have lived and still live on this territory. For example, the moa, which disappeared barely 1500 years ago with the arrival of humans, was the largest known bird (Dinornithidae family). Skeletons estimated that these animals could measure more than 3.6m high and weigh nearly 240kg. Another bird, the kiwi (Apteryx mantelli), the smallest representative of the ratite family (ostriches, emus, rheas and casoars), is endangered. But do you know weta? I invite you here to meet these incredible insects. 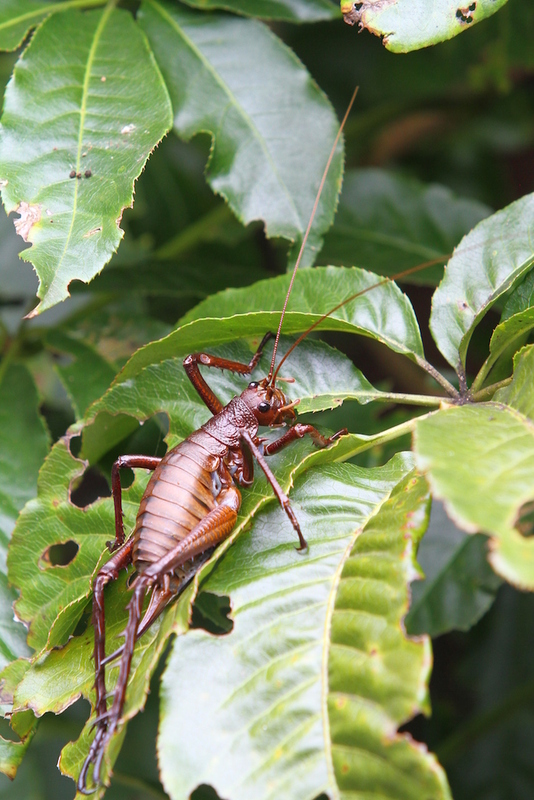 Weta are Orthoptera, an order of crickets, grasshoppers and locusts, so called in Maori language. They belong to the family Anostomatidae, characterized in particular by its sexual dimorphism : males have large mandibles, but also, adults have no wings and have on their posterior tibias defensive spurs ( see illustration 1>). The Anostomatidae, which appeared in the Cretaceous (80-65 million years) on Gondwana*, are today mainly present in the southern hemisphere : Australia, South Africa, South America and India, continents resulting from the fragmentation of Gondwana by plate tectonics. * 300 million years ago, all continents were gathered in a single continent: Pangea. Then, this continent began to dissociate (200 million years), in the north by Eurasia (North America, Europe and Asia) and in the south by Gondwana (Africa, South America, India and Australia). The isolation of New Zealand from Australia and other continents since the Cretaceous, the marine transgression of the Eocene (24 million years) and the appearance of mountain ranges over the last 5 million years (Pliocene) have allowed the emergence of a great diversity of endemic species of these insects. New Zealand is home to 56 species, classified into 5 genera and grouped into 3 categories based on morphological and ecological criteria. Recent genetic and molecular studies have reconsidered this classification and the phylogeny of these species: see the paragraph on phylogeny. 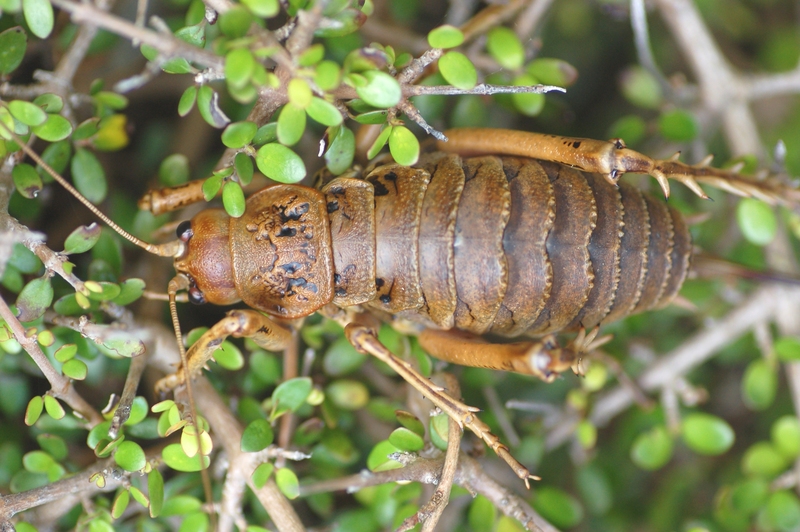 The topography of New Zealand offers a great diversity of habitats and ecological niches specifically exploited by one or more weta species. Each species has thus adapted to a particular environment whose range can extend from a few hectares to all the islands ( see map 1 and 2 in the next paragraph). Isolated from other continents before the appearance of mammals, native fauna evolved without the presence of predators and competitors mammals. Island isolation and the absence of mammals have favoured a tendency towards gigantism in many species. This process seems to occur when various factors combine: ecological niches left vacant, abundant and easily accessible food resources, absence of rapid predators (endotherms such as mammals). The animals concerned (birds, reptiles, molluscs or insects), not needing to move to feed and escape danger, transfer the energy costs associated with these activities to a gain in size and mass. Thus, some weta species, like Deinacrida heteracantha, can measure more than 80mm long and weigh nearly 45g, the weight of 2 domestic mice ! 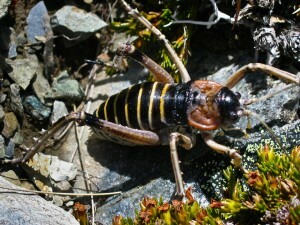 Weta are considered the biggest insects on the planet (read article on size records). The weight record is held by a female of this species retained in captivity having reached 75g. However, the situation has changed with the successive colonizations of the region by men. The establishment of the Polynesians, about 1000 years ago, was accompanied by the introduction of the first rats (Rattus exulans), then other species such as the Norwegian rat (Rattus norvegicus), the common rat (Rattus rattus), cats and other mustelidae (beech, weasel, otter…).) have arrived with Europeans in recent centuries. Facing this new competition and this new type of predation, many species of birds, reptiles and insects have found themselves vulnerable. Mammals such as rats, endotherms (with rapid and constant metabolism), quickly gained the upper hand over weta species with slower metabolism. Habitat degradation and destruction by human activities have added up, causing some species to disappear. Previously, all species shared all of New Zealand’s habitats, some with wider distributions than others according to the habitat types to which they were subservient. The ranges overlapped and connected to each other. Since the arrival of humans and their procession of predatory mammal species, the distribution of many of these species has declined dangerously to the point where they have almost disappeared. However, very small relict populations have survived on tiny isolated islands or remote sites with poor access. While they have also suffered from changes in their environment, species of the genus Hemideina are the most common in New Zealand. They can still be found in anthropized areas and even in urban areas. However, the Hemideina ricta species has the smallest range, limited to the Banks Peninsula ( see map 1). The species of the genus Deincrida, Anisoura, and Motuweta occupy preserved areas of a few hectares for some of them. For example, Deinacrida heteracantha, the largest species (80mm and 45g), is currently found only in northern New Zealand, on Little Barrier Island, the least inhabited. Very close to it, Middle Mercury Island shelters on only 13 hectares another endangered species: Motuweta isolata (see photo 1 in the next paragraph). In the south, the species D. carinata is only present on the island of Kundy and in the centre, D. rugosa, on three islands of the Stephens archipelago ( see map 2 above). The species D. mahoaenui, discovered in 1962 by the English John Charles Watt (1936-2006), survives only on an area of less than 240 hectares and is the subject of a conservation programme. Another species, the most recently discovered: Motuweta riparia, lives on rocky slopes near rivers in the Kahutapere, Manganuku and Mangatutara regions. This species, because of the difficulties of access to its habitat, is probably not so rare. The ecology of the species of the Anostomatidae family in New Zealand is different from that of the species in Australia and New Caledonia. They are phytophagous, nocturnal and feed on shrubs and trees while those from Australia are detritus feeders and feed on the ground. 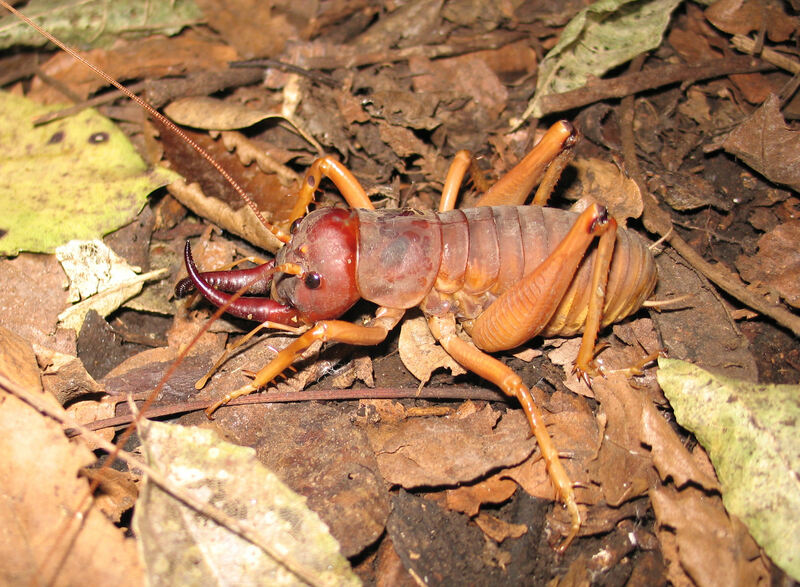 In addition, New Zealand weta live in temperate and subalpine environments, while in New Caledonia and Australia Anostomatidae live in humid tropical forests and are absent from temperate regions. We will focus here on the largest species of weta : the group of “Tusked Weta” (weta with tusks) : genus Motuweta and Anisoura, and the “Giant Weta” (giant weta) Hemideina and Deinacrida (refer to previous paragraph) (see photo album at the end of article). These species are so called because the males have particularly impressive growths on their mandibles forming tusks curved forward in the manner of those of elephants (see photo 1 below). Issues of this evolutionary process related to sexual competition, these appendages are used in fights with congeners for access to females during the breeding period. >Anisoura nicobarica is the smallest species of all weta : 20-23mm. The nocturnal individuals feed on the soil on decomposing plant and animal matter (scavengers). 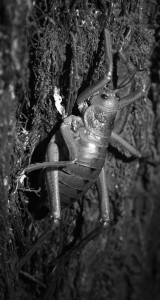 During the day, they take refuge in holes in trunks and stems of shrubs and trees, head outwards so they can present their mandibles to all intruders. During moulting, the insect is no longer protected by a rigid cuticle (lire this article) : it then obstructs the entrance to the hole with a mixture of saliva and sawdust. The species is found in forest environments but also in more anthropized environments. It shares the same habitats as H. thoracica ( see map 1). Motuweta isolata and Motuweta riparia are two closely related species whose radiation is recent (separation from their common ancestor). M. isolata is the larger of the two: 70mm and 20g versus 40mm and 4.5g for the second (see photo 1). Both live in cavities on the ground and block the entrance during the day and during moulting they feed at night. Females may use several burrows spread over an area of 20m2. Their diet is similar to that of A. nicobarica. M. isolata lives only in the coastal forests of Middle Mercury Island and, good climber, feeds in vegetation. The hole is blocked with a mixture of soil and saliva. M. riparia, the most recently described species, is, for its part, dependent on particularly inaccessible rock habitats close to watercourses (less than 3m). Populations are probably not rare, but their observation is difficult. Individuals feed on vegetation on the ground. The hole is closed with a mixture of silt and saliva. This species can jump into the water to escape a threat. Their development cycle takes place over 3 years, 2 winters in juvenile form and the third as an adult. 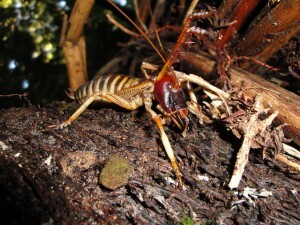 Giant weta are species of the genera Hemideina and Deinacrida, grouped according to their ecology. These four species, measuring 40-60mm, are the most common in New Zealand: they occur in gardens and other anthropized environments. These species live in tunnel-like cavities in trunks that they do not dig themselves but either by larvae of Ochrocydus hutoni, a beetle of the family Cerambycidae, or by butterfly caterpillars Aenetus virescens (family Hepialidae). Natural cavities may also be suitable. Unlike the previous species, Hemideina arboricoles enter the cavity with their heads forward, exposing the spurs of their posterior tibias to intruders. All these species are strictly phytophagous (leaves, fruits and flowers). 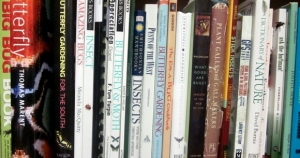 Invertebrates may occasionally be included in their diet. No specific host plants are preferred, both native and exotic species may be suitable. However, a majority of individuals are found on the following plant species: manuka (Leptospermum scoparium), kanuka (Kunzea ericoides), ngaio (Myoporum laetum) and mahoe (Melicytus ramiflorus). Individuals remain in trees throughout their lives: only females go down to the ground to lay eggs. There is a significant sexual dimorphism between males and females. Males, larger than females, have enlarged heads and mandibles: these morphological traits enter sexual competition and have therefore been selected during evolution. Such traits increase the chances of males to access a resource-rich site, conquer females and achieve better reproductive success (Fitness) (see photo 2). Their geographical distribution depends on altitude and vegetation type. 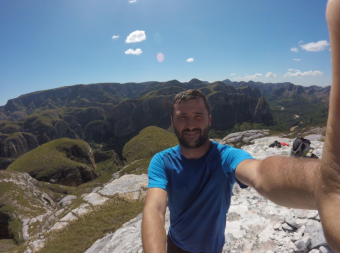 For example, H. crassidens occurs between 0 and 1100m and H. thoracica at altitudes above 1100m. Overlap areas exist around 800-900m. These two species live in open areas with no vegetation cover. They protect themselves during the day in natural cavities, or dug by lizards or other animals, in soil made of earth or rocks. They feed at night on plants and show sexual dimorphism. Their ranges overlap to a large extent (see map 1 above), H. ricta favouring high altitudes (>800m) and H. maori areas below 450m. The two species are phylogenetically close, their common ancestor having diverged recently (read paragraph on phylogeny). Weta of the genus Deinacrida have a life span of 3 years, the adult state only occurring during the third winter. The three cohorts (age category) thus cohabit permanently. Females lay eggs in the soil in the fall using their ovipositor (elongated circuses forming a “sabre”, also called scape). These three species are the largest in New Zealand. Some individuals of D. heteracantha can reach 75mm and 45g (see photo 3). Arboricultural and phytophagous, they occur only in forest habitats where individuals use the plant structure during the day to camouflage themselves in the vegetation. D. heteracantha now survives on only 3083 hectares on Little Barrier Island where rats were eradicated in 1980. The range of D. fallai is also insular and is limited to Poor Knights Island: no evidence of the presence of this species on the large islands of New Zealand has been reported. Its environment, devoid of any degradation and predators like rats, still allows D. fallai to prosper. The third species, D. mahoenui, is present in a small locality of the big northern island ( see map 2 and photo 4). Its population is maintained in an area invaded by an exogenous plant: the Barbary rush (Ulex europaeus) whose dense vegetation offers protection and food. 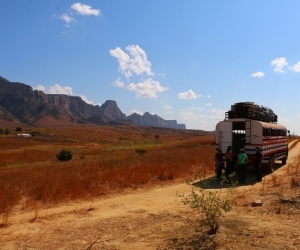 Conservationists are thus faced with a paradox where the elimination of an invasive species can lead to the loss of an endangered native species. The juveniles of these three species are sedentary unlike adults. Larvae of D. mahoenui can for example carry out their entire development cycle on a city with a volume of 1 to 3 m3 only. Adults, on the other hand, are able to move over 30m at night, especially males looking for sexual partners. During the day, they remain camouflaged both in trees and shrubs and at ground level under bark. Epiphytes (plants growing on others) also provide refuges for adults and sometimes for juveniles at the end of their development. Cavities are rarely used because of their imposing size which prevents them from reaching them. In addition to its characteristic blue-grey colour, with red, black and white lines on the legs, this species is distinguished from others by its particularly rocky habitat (cliff) without vegetation and high altitude (800-1700m). The rock must be stable and provide cavities to allow individuals to enter during the day. The species occurs in two regions: Seawaer Kaikoura and Mount Sommers (See map 2). D. elegans does not have defensive behaviour as other species can have. Threatened, the individual jumps and lets himself be rolled by folding these legs. This abrupt environment remains even dangerous, because dead individuals at the bottom of the cliffs could be found probably following falls. These two species are very similar. The slight morphological and karyotypic (chromosomal) variations do not make it possible to separate the different populations into two distinct species. As their name suggests, D. rugosa (and D. parva) are easily recognizable by the rough texture of the cuticle of their tergites (dorsal cuticular elements of the abdomen) and thorax, as well as by their ochre-brown or even straw colour (see photo 5). D. rugosa is the larger of the two species: 32g for females versus 14.5g for those of D. parva. They occur in grassy habitats (meadows) composed of bushes on which they climb to feed at night, returning during the day to their cavities in the ground or under rocks. Individuals have a thigmotactic behaviour (search for contact with an object, a plant or a stone for example). The territory of males is most often close to that of females, the latter mating with many males over a period of several months. The individuals are sedentary for several days, even a week, not moving more than one meter away from their burrow. After this period, they leave for a new site (50m) to renew the cycle. Juveniles migrate nycthemeral (day and night) between vegetation and soil. These two species seem to favour watercourses in catchment basins with alpine and subalpine climates at altitudes between 900 and 1300m. They suffered from the presence of rats. A major conservation program (removal of rats and cattle) was undertaken from 1986 to 1989 to restore the ecological community typical of the original coastal forest. A large population of D. rugosa survived on Mana Island despite the presence of rats. Resembling species of the genus Hemideina (smooth cuticle and brown pigmentation), they inhabit subalpine, grassy and high rainfall environments. With a similar morphology, these species are distinguished by 1) their size D. rainfall is greater than D. talpa, 54mm and 49mm respectively; 2) their habitat : D. pluvialis favours rocky areas while D. talpa substrates that individuals can dig to shelter head first to block entry with their posterior spur tibias ; 3) the altitude of their habitat D. rainfall occurs between 700 and 1700m and D. talpa around 1200-1300m. This group of species is characterized by the absence of a stridulatory organ on the second abdominal termite (dorsal cuticular plate) and by the presence of spines on the dorsal surface of the femur. Unlike the previous species, their cuticle is finely rough. D. connectens is the largest of the three (45mm). Greyish in colour, with white legs, it is found in mountainous areas, on arid, rocky slopes with no vegetation at altitudes ranging from 770m to over 3600m (see photo 6). It has the widest range of all giant weta (see maps above). At night, individuals spend the day in shelters under rocks. Cantonne au Mont Arthur (see map 2), D. tibiospina is mainly found in grassy areas between 1000 and 1500m altitude. With an average size of 33mm and 7g, the species is the smallest of the group. Its colour, generally darker than D. connectens and pulling on reddish-brown, allows it to camouflage in low vegetation during the day. D. cariant is known from only one locality (Kundy Island). Knowledge of its habitat remains uncertain. It measures on average 40mm for 6g, which makes it the lightest of the group. 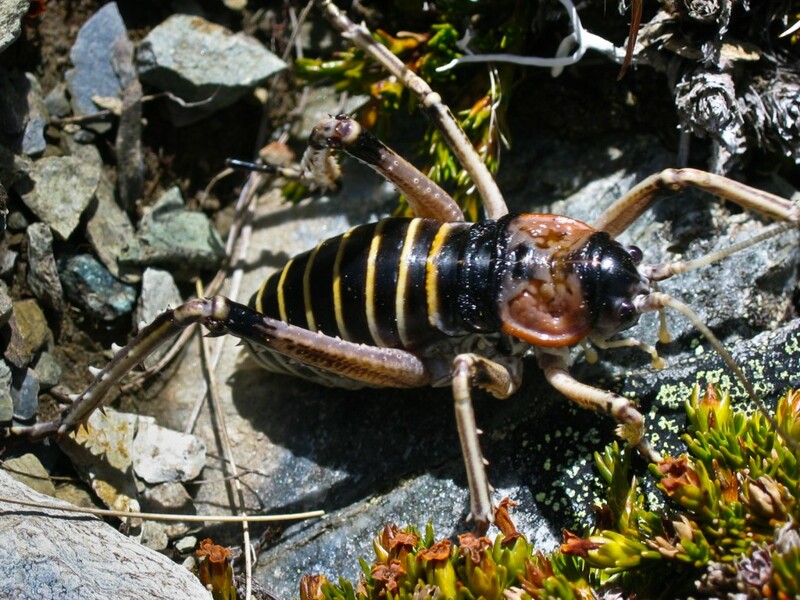 This region offers an interesting study model to understand the mechanisms of evolution and especially the complexity of the evolutionary history of weta. The classification of these species was therefore based on morphological characters. However, the advent of modern molecular genetic tools in recent years has led to many inconsistencies. So, P.M. Johns (1997) proposed that species of the genera Anisoura and Motuweta (weta with tusks) be related to the other two genera of giant weta Hemideina and Deinacrida. Mitochondrial DNA analysis of these species by Steven A. Trewick and Mary Morgan-Richards in 2004 showed, on the contrary, that these two lines were not related. It also turns out that the genera Anisoura and Motuweta are not close to the genus Hemiandrus (see figure 2). The identical morphology (enlarged mandibles) of these species is not based on a common ancestor but comes from a process synaptomorphic : appearance of homologous organs independently between several unrelated lines (example : wings of birds and mammals). 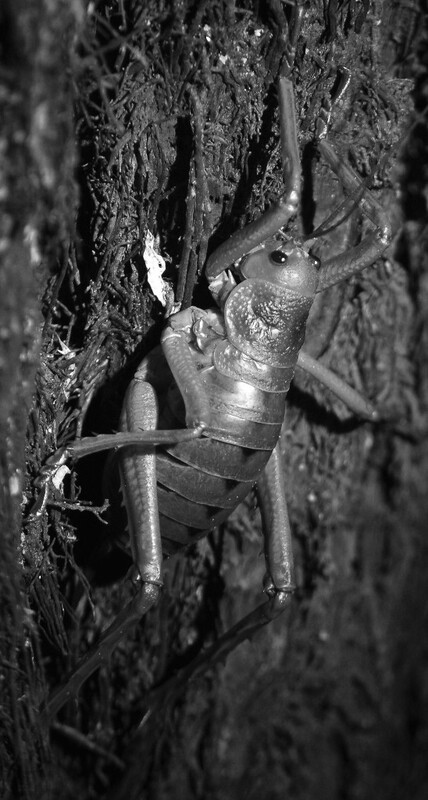 In order to clarify the place of weta with defences in the phylogenetic tree, new genetic analyses must be undertaken and compared with species of other genera present in Australia and New Caledonia. Their study indicates, in a second time, that the genera Hemideina and Deinacrida (subfamily Deinacridinae) are related and come from the same common ancestor monophyletic line. The diversification of these genera into many species (radiation) coincides with the appearance of the alpine mountain range in the Pliocene (7-2 million years ago). This radiation was rapid where six lines could be identified : 1) H. broughi/D. rainfall/D. talpa ; 2) D. mahoenui/D. heteracantha/D. fallai ; 3) D. parva/D. rugosa ; 4) H. crassidens/H. trewicki ; 5) H. maori/H. ricta ; 6) D. connectens/D. tibiospina/D. carinata (see figure 3 and 4). This result confirms the morphological and ecological classification presented above. The strong genetic diversity existing between these species suggests that the radiation between these two genera is old. The radiation between the weta with defences (Anisoura and Motuweta), the Hemiandrus and those of the subfamily Deinacridinae goes back to Miocene (24 million years), thus before the separation of New Zealand and Australia. Results of a second study conducted by the C.R. team More generally, Pratt in 2008 reveals that the Anostomatidae family is similar to the Gryllacrididae and Stenopelmatidae families. Also, the most surprising is that all the species of the Anostomatidae family do not come from a common ancestor: polyletic line ( see figure 4 below). The study shows that the genus Hemiandrus is also polyphyletic. After this research, it seems necessary to completely review the classification of this family. Indeed, some unrelated species are grouped in the same genus and, conversely, related species are integrated in different genera. The evolutionary history of these insects remains incomplete. The hypothesis is that weta have diversified and evolved by taking possession of ecological niches left vacant by the absence of mammals. The radiation process that led to the emergence of all these species has no equivalent in vertebrates. I want to thank Mary Morgan-Richards – Steve Trewick – Corinne Watts – Danny Thornburrow for sending me such beautiful pictures directly from New Zealand! Previous article Previous post: How strong does an ant develop?